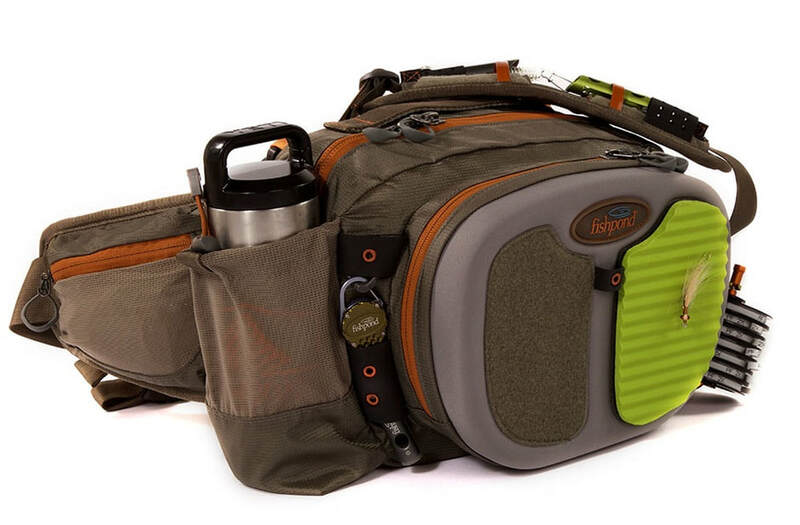 Fishpond Gunnison Guide Lumbar Pack is the new standard in fly fishing hip packs that will comfortably carry all you need for a day on the water. After 25 years of guiding in one of the most rugged canyons in the west, I appreciate quality products that make my job easier. Comfort, durability, and performance are of the utmost importance when amassing fly fishing gear to battle the elements. I hate to admit it—but I’m a gear-junkie! I’m always looking for new ways to have the upper hand in fooling selective trout. Each season when new merchandise becomes available, I make it a point to get up to speed with the latest and greatest equipment. For the past three months, I’ve been using Fishpond’s Gunnison Guide Pack. Built and designed for anglers who carry a lot of fly boxes, terminal tackle, and other gear into rugged terrain like the Gunnison Gorge and Cheesman Canyon, the Gunnison Guide Pack is a must-have for any serious angler! The Gunnison Guide Pack integrates the best features of Fishpond’s other proven lumbar packs, with additional space to keep things organized. The Gunnison Guide Pack is constructed out of recycled Cyclepond nylon. It is lightweight, comfortable, and extremely durable! Additional features include a net holder, places to hold large fly boxes or water bottles, fly patches, gadgets, and tools (Headgate Tippet Holder, Arrowhead Retractor, Sawtooth Clipper, etc). Fishpond’s Gunnison Guide Pack is lightweight, comfortable, and durable. Its spacious design allows anglers to keep their gear organized without any compromise. A productive day on the water begins with flawless organization. The Gunnison Guide Pack has two compartments that hold everything you’ll need to spend a long day on the water. Each section is equipped with with either open-ended or zippered pockets. The rearward compartment holds a dozen fly boxes, leader wallet, camera, and much more. I use several varieties of fly boxes to keep organized. I am a huge fan of the Richard Wheatley Swing Leaf Fly Boxes. They allow me to stock upwards of 2000 flies per box. I typically carry at least two of them with me at all times. I also tote along several of the new Umpqua UPG LT fly boxes. I fill these with my go-to guide flies that I use on a regular basis. This allows for easy access and quick restocking without any hassles. For dry flies, I use Myran 1800 Fly Boxes. These fly boxes help protect the hackle from getting damaged, in comparison to ripple foam models that have a tendency to mash down the bottom side of my flies. I store a thorough assortment of leaders (7 and 9 foot) ranging in size 2X to 5X in a leader wallet. It comes with several re-sealable plastic compartments to keep your leaders separated and organized by size and length. I carry extra spools tippet, both nylon and fluorocarbon in sizes 2X to 7X. In the front zippered pouch, I stash my terminal tackle: Yarn strike indicators, Thingamabobbers, split shot, JP’s Nymphing Mud, tape measure, stomach pump, Aqua floatant, Dry Shake, Frogs Fanny, and sunscreen. This compartment affords anglers with easy access to commonly used items. If you’re looking for a new lumbar pack, I would highly recommend Fishpond’s Gunnison Guide Pack.